From an early age I had always loved being on or by the sea and later enjoyed the times spent cruising with my son and daughter, Keith and Anne on a motor boat I owned at the time. When out on the boat, I would often look at the sailing yachts and admire their skills and use of natural power. I wanted to learn to sail safely, to buy my own yacht and cruise cross-channel to France and my ultimate goal, all around the shores of the UK. Sadly my daughter Anne died tragically at the age of 18 following three years of mental illness. Life has moved on for me and my family. Keith now lives happily with his partner and my two granddaughters in West Yorkshire and I have two younger teenage sons by a later marriage. I continued a successful career in International Marketing with major ‘microchip’ companies, later gaining a degree in teaching and moving on to teach in Adult Education. Since that time I have completed all the RYA training courses and have sailed over 6000M, completing several cruises to Devon and cross-channel to France and the Channel Islands. 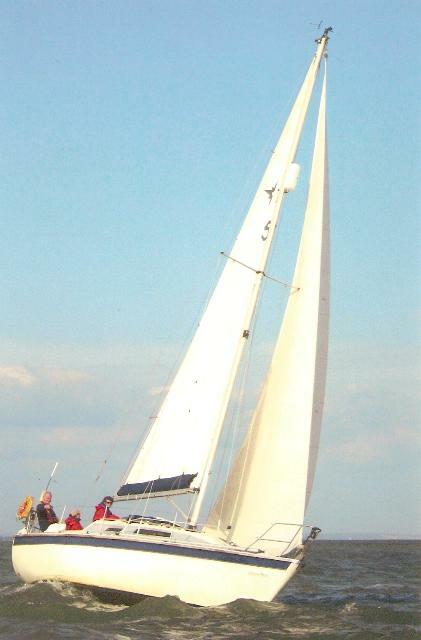 I purchased my own 31 ft sailing yacht, Christine-Marie, in November 2004 based in Lymington on the South Coast where I have done most of my sailing. I now feel ready to complete my Round UK Cruise and I plan to set sail at the end of April 2008 to achieve my goal. I do not intend to race round. I have no fixed schedule or timetable other than to arrive in Scotland by the end of August before the weather deteriorates. My plan is to cruise round, taking my time to visit the ports and harbours around the coast. I want to enjoy the scenery, new places and experiences and hopefully make new friends along the way. It will be a significant challenge for me. My passage will take me anti-clockwise round the UK sailing an estimated total of 3000M before I return to my base in the Solent in 2009. The green line indicates my route to Scotland with my first leg of 400M from Lymington to Whitby, visiting ports along the way and possibly a cruise cross-channel from Dover to Boulogne if weather and time permit. The second leg will take me to Scotland where I must make a decision on whether to sail on up towards the Orkneys or cruise through the Caledonian Canal to Oban on the West coast. This will depend on the weather, time I arrive, crew and where I plan to over-winter the yacht in a sheltered and safe location. The red line indicates my return passage in 2009, with a possible alternative route shown in blue. Detailed organisation and passage planning will need to be completed from one port to the next, closer to the time of sailing. I look forward to the planning and navigation challenges that lie ahead, to visiting new harbours and walking along the coast and in nearby countryside when ashore. In particular I am looking forward to sailing with my friends, to the peaceful and scenic bays that we will visit, to sunsets, meals aboard and on shore together and to making new friends along the way. As I write this I am busy preparing Christine-Marie for sea, fitting new sails, navigation and safety equipment in preparation for the cruise. But I want to achieve more than just my sailing goals on this adventure. I want to help raise awareness and funds for the charity Rethink that has helped me and my family in the past and continues to strive for all those affected by mental illness; for Marie Curie Cancer Care, whose nurses give their care and support to the terminally ill and their families in the comfort of their own homes; and to the RNLI, whose vulunteers put their own lives at risk to look after those like myself at sea. I have taken time to set up an on-line charity web pages and will shortly start fund raising through friends, family, and various clubs I belong to. I am a licensed radio ‘ham’ and plan to operate from sea as I make passage round the UK, making contact with hundreds of amateurs around the UK and overseas. Please visit my online charity pages by clicking on the links below, my other charity pages may be accessed by clicking on the tag Christine Marie at the bottom of each Justgiving charity page. Many thanks for your personal support, to my family, friends, sailing crew and RYA training instructor at Moonfleet Sailing without whose help this adventure would not be possible.